The Action Plan outlines key priorities for preventing arthritis, investing in research and improving treatment and support for people living with the condition. Four million Australians currently live with arthritis. It is the leading cause of chronic pain and there is no cure. Annual healthcare costs for arthritis have been estimated to exceed $5.5 billion. Arthritis Australia calls on government at all levels to invest in implementing the Action Plan to transform future outcomes and quality of life for people living with the pain of arthritis. Key recommendations include funding Arthritis Educators to provide individualised care and support, improving access to appropriate treatment and care, and ambitious investment in research. 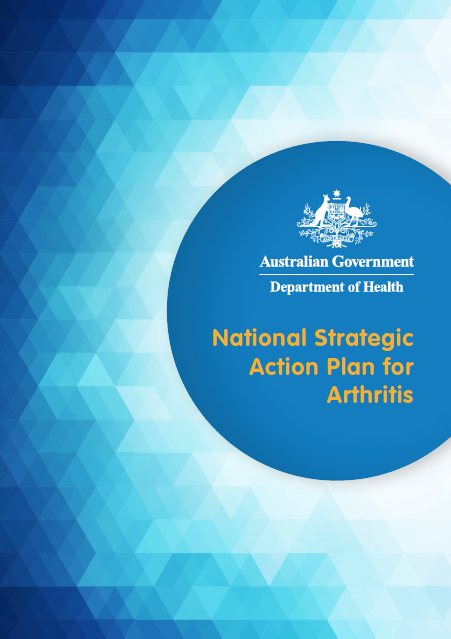 Arthritis Australia is calling on government at all levels to invest in implementing the National Strategic Action Plan for Arthritis (the Action Plan) which was launched today. The Action Plan provides an evidence-based blueprint to guide national efforts to improve health and quality of life for people living with arthritis, reduce the cost and prevalence of the condition, and reduce the impact on individuals, their carers and the community. Development of the Action Plan was led by Arthritis Australia for the Australian Government Department of Health, with input from consumer and medical groups across Australia. 26 year old Christina Maurice was diagnosed with non-radiographic axial spondyloarthritis at age 22. The Action Plan identifies three key priority areas which require urgent, immediate attention in order to reduce the health burden of arthritis both now and into the future. Awareness, prevention and education – arthritis is often incorrectly thought of as a single condition that affects only old people. Misconceptions can undermine prevention, early diagnosis and effective management. [i] In addition, few people with arthritis receive the information and support they need to help them to manage their condition. High-value, person-centred care and support – currently two-thirds of Australians with arthritis report that they are faring badly with their condition[ii], with the most common problems being inadequate pain management, lack of information and support, and the high costs of care. Research evidence and data – Investment is required across all areas of research from basic through to clinical research, epidemiological, translational and implementation research. Conduct awareness campaigns to increase public understanding of arthritis and how it can be prevented and managed. Fund arthritis educators to provide personalised care and support for children and adults diagnosed with arthritis. Develop and implement a national sports injury prevention program to reduce the risk of developing osteoarthritis. Increase funding for specialist and allied health services so people with arthritis can receive timely, appropriate and affordable care. Provide information, education and tools for health professionals to help them to deliver best-practice arthritis care. Pilot and evaluate a community-based ‘one-stop-shop’ arthritis clinic to provide a single point of contact for diagnosis, assessment, triage, treatment and referral to other services. Fund an ambitious ‘arthritis and musculoskeletal research mission’ from the Medical Research Future Fund to improve arthritis prevention, diagnosis and treatment, and support the search for cures. CEO of Arthritis Australia, Andrew Mills, sees Arthritis Educators as a vital component of the Action Plan, with individualised help and support sorely lacking from the existing system. Medical Director of Arthritis Australia, Prof Susanna Proudman, says ambitious investment in research and improving access to appropriate treatment and services is also critical. “This Action Plan shows how Australia can develop better care and support services, resulting in better health outcomes for Australians with arthritis. Ambitious and forward-looking investment in research from the Medical Research Future Fund is also critical to help find better ways to treat and, ultimately to cure, arthritis in its many forms,” she concludes.